Mathematics major Danika Van Niel ’18 conducted original research in algebraic geometry last summer within the Mathematics Department at Purdue University. In the process, she learned what a career in mathematics research involves—and discovered more about herself. “I learned about my aptitudes, and that I am ready to seriously commit to research and graduate school,” Van Niel says. Geography student Hamish Gibbs ’17 spent his summer of research with the School for the Environment at the University of Massachusetts in Boston looking at the impact land cover has on small organisms in cranberry bogs. He worked closely with a professor and a group of graduate students, spending time on field work, data collection and computer mapping. “I felt supported while I completed my individual project and had the opportunity to learn new data analysis techniques with the help of my coworkers,” Gibbs says. 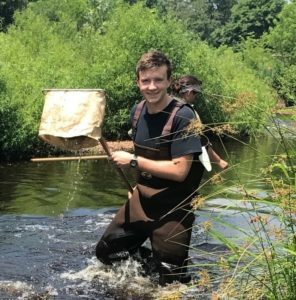 Geography student Hamish Gibbs ’17 spent his summer of research with the School for the Environment at the University of Massachusetts in Boston looking at the impact land cover has on small organisms in cranberry bogs.